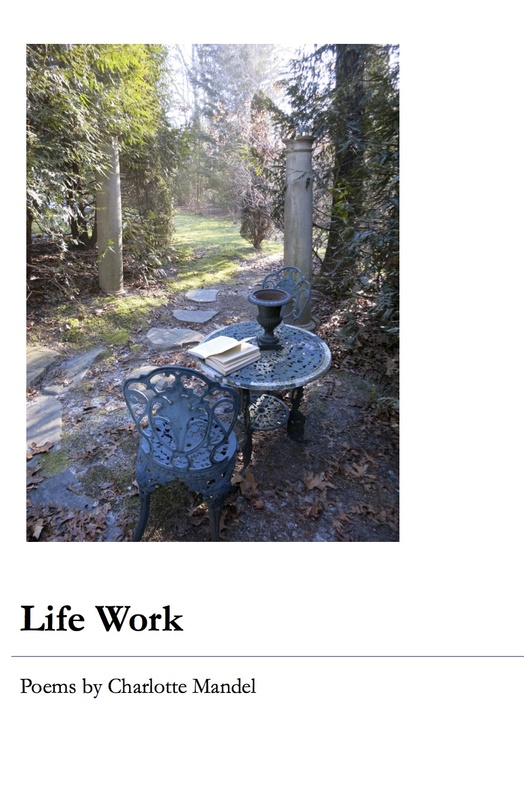 Life Work, Charlotte Mandel’s eighth collection of poetry, is arranged into five sections, each one containing poems related either by content or form. The collection is, therefore, something like a compilation of chapbooks, and it illustrates the title’s suggestion—by including such a range of poems, the book does seem to represent a poet’s “life work.” Many of the poems are written in received forms, from sonnet sequences to pantoum to ghazal. Several of the poems are elegiac; others are ekphrastic. They describe the quotidian—a new mattress, an old sweater—as well as the majestic, both immanent and transcendent. The first section contains several elegies to the speaker’s husband, often composed as sonnets. “Crossing the Calendar Bridge” is a sequence of three sonnets that trace grief’s evolution, eventually linking end to beginning. In a sense, it does begin at a beginning: New Year’s Eve, but it is the first New Year’s after her husband’s death, and the speaker recalls his New Year’s ritual, the recitation of a sentence which now can never again be true: “Lucky us, we’ve earned / another year.” By the end of this sonnet, she imagines him waiting for her with a “welcoming embrace”; the next sonnet begins, “I did not always welcome his embrace.” So this middle of the three sonnets explores some challenges and rewards of marriage. The final sonnet of these three returns to grief, and it is the most formally intriguing of the three. In the second sonnet, the speaker had referred to the match between herself and her husband as “rhymes” that “were true or near or simply free.” The rhymes in these sonnets are as often near as they are true, and at times they border on free. In the third sonnet, the rhymes are almost never exact. As the poem nears its concluding couplet, however, its attention turns to language itself as a factor in experience. Mandel says: “Get past the calendar, switch off the screen / stop conjugating ‘is’ as ‘might have been.’ // Yet how to tell the poem ‘don’t reminisce’ / all moments lived are sparks to genesis.” On the one hand, the speaker encourages herself to receive the present as it is rather than interpreting it as absence. Yet she also addresses a conundrum—how to convey the difference between what was and what is without reminiscing. As we reach the final line, however, the rhyme—reminisce/genesis—delights us. We are surprised by what the form can do, and so we pause—as we would at the concluding couplet of a Shakespearean sonnet anyway, or as we would at the concluding line of any poem—but here we pause to consider the truth that this rhyme forces: everything does lead to beginning, whether that is the beginning or a (perhaps new) beginning. “Sparks” here is a particularly interesting noun, especially as they are not sparks from but to genesis. That aspect of ourselves that is life, that spark brightening for a moment before it dies away, does connect us to the beginning. The poem works in part because it leads not where we would expect, to an end, but instead it chooses to end with beginning. I’ll discuss only one other poem, this one written a bit more freely than a sonnet demands, yet not entirely in free verse either. “Flood Washed” is written in energetic syllabics and describes a snake, already dead on the sidewalk, which serves to recall an earlier snake killed by the speaker’s husband. The poem is composed in couplets. In the first several, the first line consists of nine syllables while the second line consists of three. Eventually, the pattern is reduced to lines of eight and three syllables, then seven and three, then again eight and three. The speaker is attracted to the snake’s beauty, linking it to creative desire: “Who framed you, the visionary / poet asks— // from whence comes this earthly design / built into // matter’s insistent desire: In / all things, form.” A snake can seem oddly formless, and yet its length curls into forms as patterns of scales create forms of its skin. If not all pattern and form create beauty, beauty nevertheless requires pattern and form. In concluding with the word “form,” the poem itself testifies to the beauty of its own structure, and it confirms the beauty of form in much of the rest of the collection. I often find contemporary poetry written in received forms a little heavy-handed; I hear the metrical rhythms too definitely. The rhythms of Charlotte Mandel’s poems are refreshingly subtle, often nearly natural. I appreciate poems written in received forms most when my recognition of the form is secondary to my appreciation of the whole, as it is throughout Life Work. This entry was posted in A Review A Week on January 12, 2014 by Lynn Domina.